The very first step to deep clean mattress is thorough vacuuming because vacuuming would clean the dirt and dust accumulated on the top surface of the mattress. Also, see that you vacuum both sides of the mattress instead of focusing on only one side of it. For effective vacuuming, you can a use an upholstery attachment with your vacuum where you should clean the mattress either horizontally or vertically. Well, you might be thinking about the reason for deodorizing before deep clean mattress. See, mattresses, when used for a long time period, can develop an unpleasant odor of itself and in order to get rid of it, you can add this step of deodorizing in your deep cleaning process. You can easily deodorize your mattress by sprinkling baking soda mixed with your favorite essential oil on it. Let it stay for half an hour then vacuum it again (using the upholstery attachment). 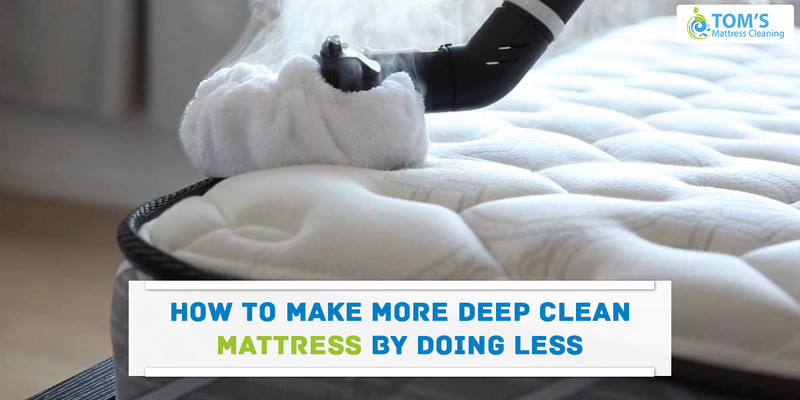 This is the simplest and cost-effective way of deodorizing a mattress. Your mattress might have got tough spill stains and spots while you were using it on daily basis. And there are some stains that are hard to deal with. For such stains what you can do is attend to it as soon as possible. Never ever make the mistake of letting it dry in the open air. Clean a fresh stain with a wet cloth just by patting on it (don’t rub it) and then use a dry cloth to soak up the excess moisture (if there is any). And if for any reason you end up getting tougher stains and spots on the mattress’s surface then you should use a cleaner available in the market. Use this cleaner with a gentle toothbrush and then clean the mattress with a damattress deep cleaning cloth. Make sure that you let the mattress air dry properly before using it again. You can use a hairdryer or even place fans in the room to speed up the drying process. Note: The most important thing here to keep in mind is letting the mattress dry after the clean up because damp left out areas can lead to the growth of mold which in turn endangers the health of you and your loved ones. Moreover, it’s always better to contact the professionals at Tom Mattrss cleaning who has the right cleaning equipment, products, methods and the experience to deep mattress cleaning Melbourne.